If diversity and accuracy matters! 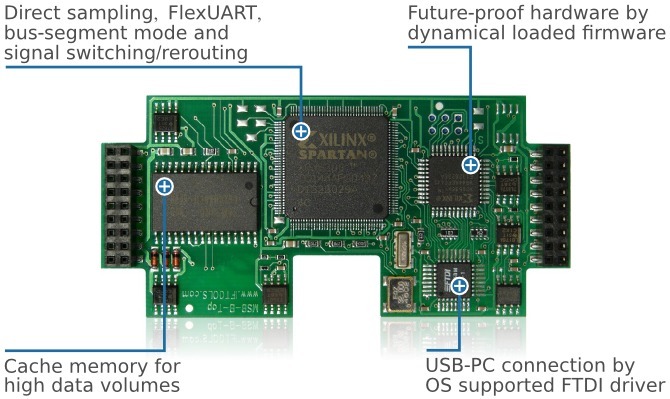 Tracking your field-bus in real-time and with 1µs time precision. Indispensable for time critical protocols. All you need in a small robust case. for analysis and optimizing of all RS232 and RS422/485 field-bus connections. 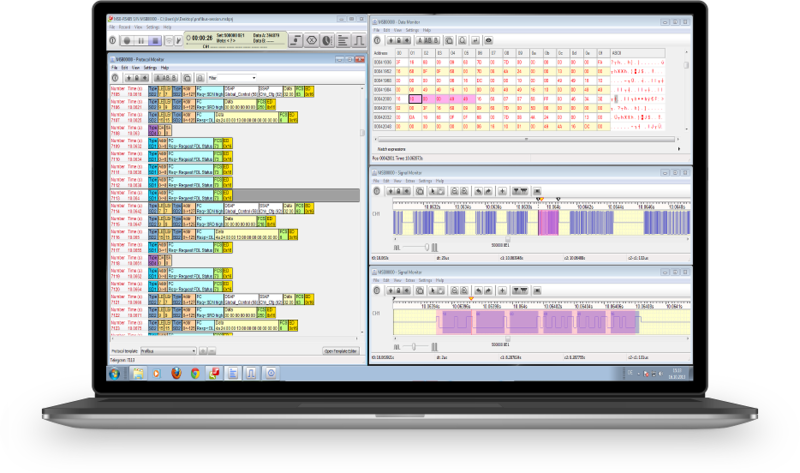 It gathers exact information about every line change with 1µsec precision – indispensable for each analysis of time depending protocols like Modbus RTU, Profibus or similiar. Concurrent analysis from the phys­ical tri-state signal to the top-most levels. All layers are only a click away. Check the data signal behind a telegram or measure the time between bits, bytes or sequences. Synchronize the display of differ­ent layers. Let the tri-state view follow the data or telegrams and vice versa. Using a powerful protocol template script engine the analyzer is able to parse all thinkable fieldbus protocols. And together with an unique box model it allows the user to format and summarize the telegram output in an extremely wide range. Don't miss anything when you are going to analyse RS232 or RS485 connections! All necessary tools in a small case and with a special price! The analyzer is able to parse almost all thinkable RS232 and RS485 fieldbus protocols. With the integrated Lua protocol template editor it is easy to adapt or write a template for your very own protocol. Simultaneous presentation of different telegram layers, e.g. showing embedded protocols in an extra window. It is a pleasure doing business with you. I have recommended your company to our business partners so I expect that you will receive a few more orders for analyzers from other Swedish companies within the next month or two. I just wanted to let you know that the Protocol Monitor allowed me to solve the our customer problem in about an hour (even though I had originally made my travel arrangements to stay 2 days in case I needed it). I am very happy with the simplicity of the MSB-RS485 and the way that the software works. Configuration & scripting is easy to understand and well documented in the manual. In this one occasion I asked for help, it has been given by starting with the solution!